For those of you who are fans of my Facebook page, you know that my baby girl turned 1 on Friday. Really? 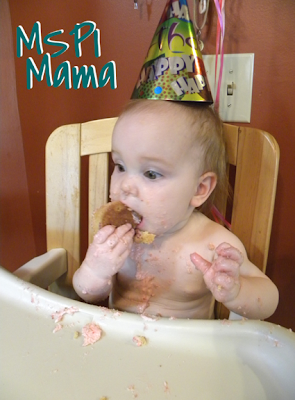 ONE YEAR OLD? Yes, a whole year has flown by! Wowsers! Since strawberries are just gorgeous right now in the stores, this choice for a cake came naturally. 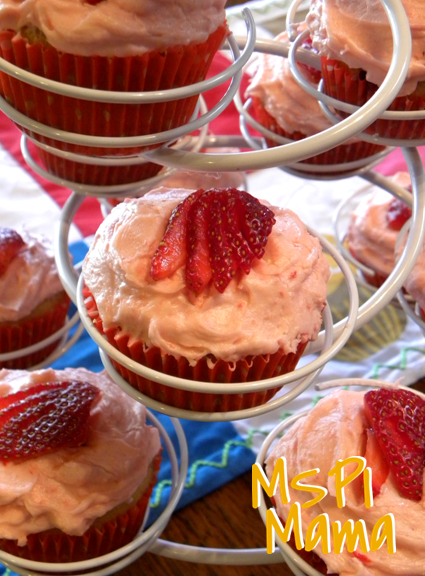 The strawberry-flavored yellow cupcakes are studded with chunks of fresh strawberries, and the pièce de résistance is the Strawberry Frosting mounded on top. It literally tastes like strawberry ice cream. So creamy! Preheat oven to 375 degrees. Line a cupcake pan with 18 cupcake liners. Lightly spritz liners with cooking spray. In a medium bowl, beat oil, egg and sugar with a handmixer. Once thoroughly combined, add in rice milk. In a small bowl, carefully whisk together flour, baking powder and baking soda. Mix carefully into wet mixture, until smooth. Fold in the strawberries. Divide batter between cupcake liners. Bake for 15-20 minutes until golden and tester comes out clean. Remove inmediately from the pan after baking and let cool completely on a wire rack. Top with frosting and garnish with fresh strawberries. Place strawberries and water in a blender, pulse until berries are pureed. Add more water, if needed. In a mixing bowl, beat margarine and shortening until light and fluffy, about two minutes. Add in powdered sugar, extract, a few drops of red food coloring and half of the strawberry mixture. Beat until light and fluffy, about three or four minutes, adding more strawberries or powdered sugar, as needed, to get the right consistency. Tip: The amount of strawberries needed for the frosting really depends on the size of the berries. If you have any puree leftover, you can make Strawberry Lemonade. Don't worry, the recipe is coming! margarine? doesn't that have dairy? Sarah: There are a few MSPI-friendly margarines available on the market. My favorite for baking/cooking is Fleischmann's Unsalted Sticks, which is dairy free. Would this still turn out well if I used blueberries instead of strawberries, do you think? My little boy is ONE next week and this recipe will be better than the one I was going to use, which was just ok. He's Dairy, soy and beef allergic. I found a frosting that will be perfect for him too! Victoria: You could probably sub blueberries, however, keep in mind the cupcakes might come out a little drier since the strawberries give off a lot of their juices whereas I think the blueberries don't do that as much. Maybe try googling "blueberry cupcakes" and see if there's a recipe you can adapt?